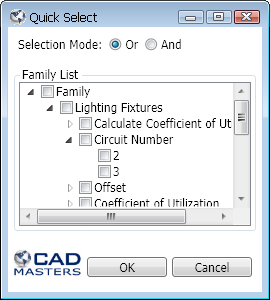 Quick Select command for Autodesk® Revit® to select by element type and its properties. Expand the element or family type and select the properties that you wish to filter by. Click OK and all those elements will be selected. When in “Or” mode, the command will select all elements that match any of the properties. 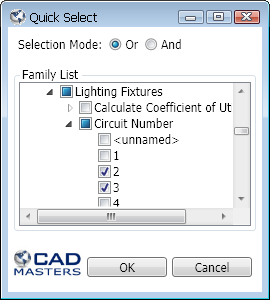 When in “And” mode, the command will only select elements that match all the selected properties. Note that if you have any elements selected when you initially run the command, there will be a prompt to only use the selected objects. Use this if you are interested in selecting from a particular view, or if you need to continually narrow down your selection. The free RQuick Select add-in may be downloaded from the Autodesk Exchange Apps website.